pork | What Am I Eating? I usually spend a lot of time planning and preparing for family holidays and special occasions. This Father’s Day, however, I decided to go simple. What better than burgers? I make fun of my dad constantly for single-handedly keeping McDonald’s in business. He loves the coffee drinks, and the hamburgers, and the cashiers know him by name. I would understand his fast food fascination if he experienced few home-cooked meals at the kitchen table. But, his wife (and professional chef daughter!) keep his stomach full (if not fat, those who know him understand!). So, I really see him as my biggest challenge. I may never convert my family to live a fully organic lifestyle, but can’t I at least reduce the number of fast food napkins in the glove compartment? I love great burgers, but so few I eat actually fall under that category. I don’t like burgers super-huge and beefy, I enjoy not feeling sick after eating one! So, the first step in my burger-making day included a trip to New Seasons. I picked up ground beef, ground pork, organic buns (made with beer! ), tomatoes, pickles (finally, a source for the elusive organic pickle!) and locally grown red leaf lettuce. Including ground pork in the burgers always gives them a flavor I prefer. More levels of interest for my tongue, and not as heavy. The combination, plus the high quality of the meat, made my brother ask for the ingredients in the recipe. After I recited the list he said “Really, no Worcestershire or anything?” I guess it sounded too simple! Two of my brothers even asked for seconds. Not that strange, considering their bottomless pit stomachs, but still flattering! Combine all ingredients in a large bowl. Mix evenly and well, but be careful to not over mix. The more you mix, the tougher the meat becomes. Form into 8 patties and refrigerate. Preheat the grill (or a sauté pan, if you lack an outdoor grill, or just prefer a house perfumed with tasty burger aromas!) over medium-high heat. Add the burgers to the grill, and do not touch. Burgers only need one flip! The more you mess with them, the more juice they lose and then they dry out. They are also more likely to fall apart. Let the burgers cook, untouched, until they look about half done. They should lift easily off the grill with a spatula at this point. If they have to be forced, they are not ready yet. Flip the burgers and continue cooking until they are done. 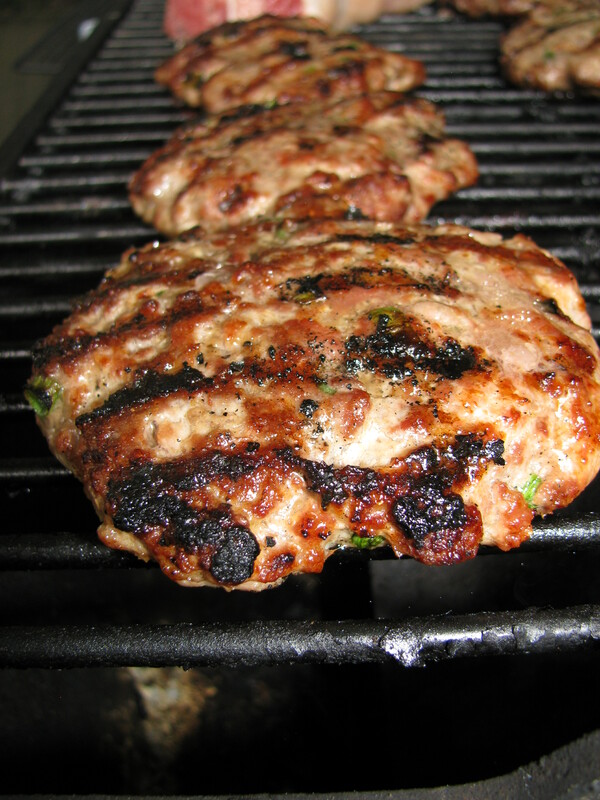 Because pork is included in this recipe, the burgers should be served well done. 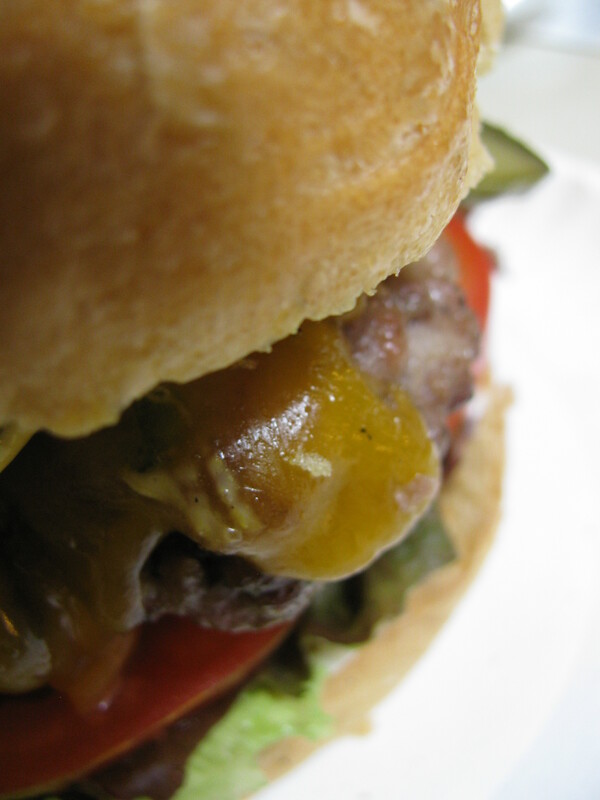 Add cheese (if desired) just before they finish cooking, and serve on a bun with your favorite condiments. If you live in the Portland area, you need to try Pambiche. Great Cuban food at reasonable prices and fabulous desserts as well. I don’t eat out often anymore, but when I do, I try to make it mean something. I prefer to support the local businesses as often as possible. No one makes a better Cuban sandwich than Pambiche (not a lot of Cuban competition around here) and they serve it with salty-sweet-crunchy tostones (fried plantain chips) and banana ketchup. But, I can’t always justify going out to eat, when I can replicate the results in a satisfactory manner at home. I woke up a couple of days ago craving a Cuban sandwich slathered in yellow mustard and dripping melted swiss cheese. I tried to ignore the craving and decided to start my morning with homemade granola and a walk. I spent the morning walking the Springwater Corridor, but not surprisingly (I do live in Oregon, don’t I? ), ended up getting rained out. Luckily, I found myself on Milwaukie Avenue by the QFC grocery store as raindrops pelted my ponytail. I decided to look around, and found a good selection of organic options. Well, for May in Oregon, anyway. I also found the Draper Valley chicken that I serve at work, but could not locate in local grocery stores. I felt satisfied with my purchases as I exited the store with a natural pork shoulder (very hard to source organic meats! Come on pig farmers! ), a pack of organic ham, organic swiss cheese and some whole wheat buns. Oh, and a jar of pickles. 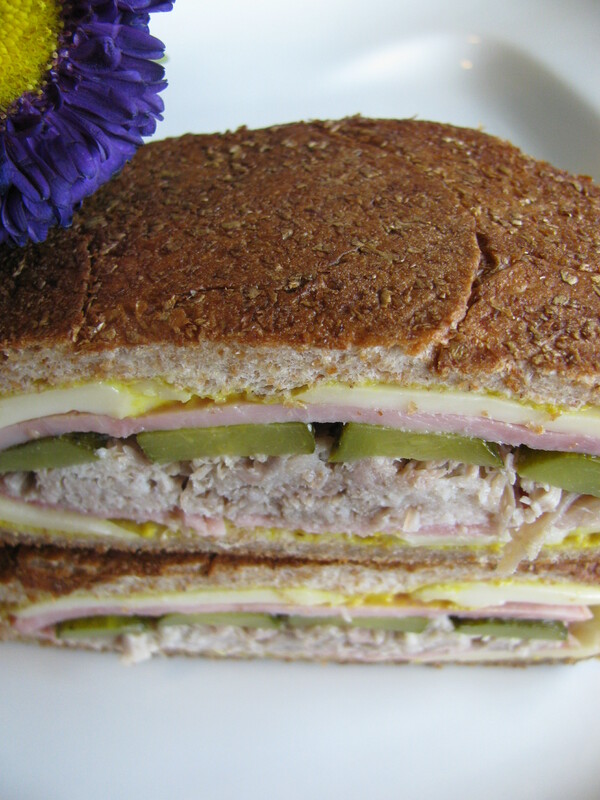 Not organic, but cravings for Cuban sandwiches compare to cravings for chocolate or ice cream. Not easily ignored. 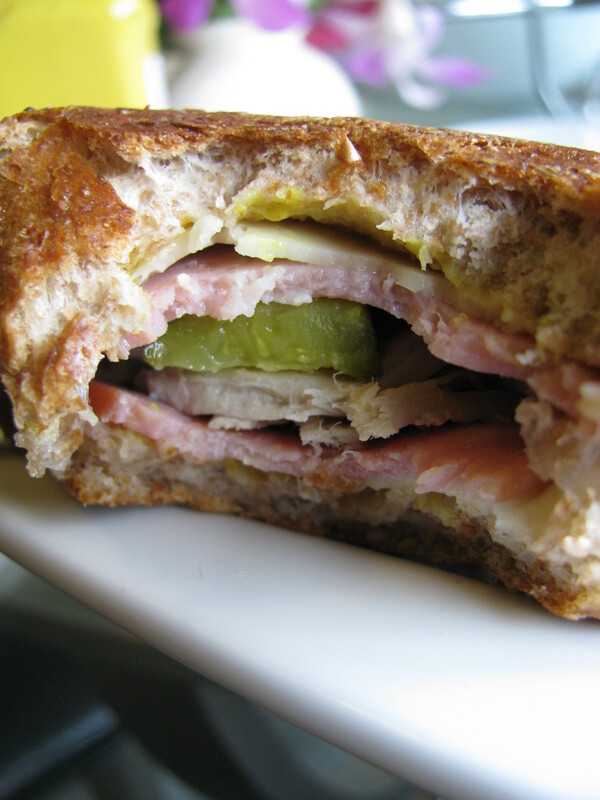 A Cuban sandwich must include pickles! This summer I promise to can tons of my own kosher dill pickles, but until then, I find myself at the mercy of the grocery store shelf. I arrived home with my treasures, and immediately stuck the pork in the oven. Now, many fancy recipes for pulled pork exist, but when a Cuban sandwich craving strikes, I prefer to go the quick route. Cut the excess fat from the meat, rub it generously with kosher salt, throw some water in the pan and let it go. Ok, so not the quickest route, as the pork takes about 3 to 4 hours in the oven. Most alternatives take longer though! Finally, several hours later, I sat down to enjoy my yummy, pork-stuffed creation. Worth every minute of preparation, and definitely satisfied my Cuban craving. Only problem, I woke up the next morning with my mouth watering for more salty ham, tender pork and tangy pickles stuffed in whole wheat bread. At least this time my refrigerator already held all the ingredients I needed! Maybe by the end of this week I will tire of the combination. Maybe. Help! The pan of applesauce is crushing me! Cut the excess fat from the meat, the more fat you remove, the leaner the pork will be. Rub generously with kosher salt and place in an oven-proof dish. Add about an inch of water, and cover with foil. Bake at 300 degrees for 3 to 4 hours, or until the pork easily shreds apart when touched. If you have to force the pork to shred, it has not cooked long enough. Remove the pork from the liquid immediately (be careful, it will be hot and should fall apart easily), and cool briefly. When cool enough to handle safely, shred with your hands or with two forks. (I prefer my clean hands, a chef’s best tool!) Refrigerate until completely cool (under 40 degrees) then cover and store in the refrigerator. If your pork shoulder is bigger, it will take longer to cook. A full-sized pork shoulder can take as long as 12 hours. Just pay attention to it and check it occasionally for tenderness. Preheat a sauté pan over medium low heat. 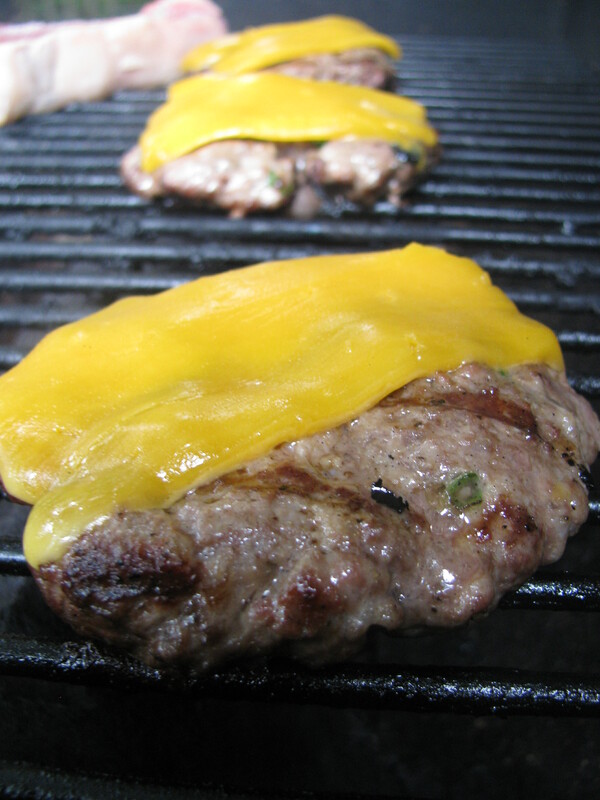 Spread both cut sides of the bun with yellow mustard. Add a slice of Swiss to each bun half, then a slice of ham. Top the bottom bun with the pork, and then the pickles. Add the top bun. Add a teaspoon of olive oil to the preheated sauté pan. 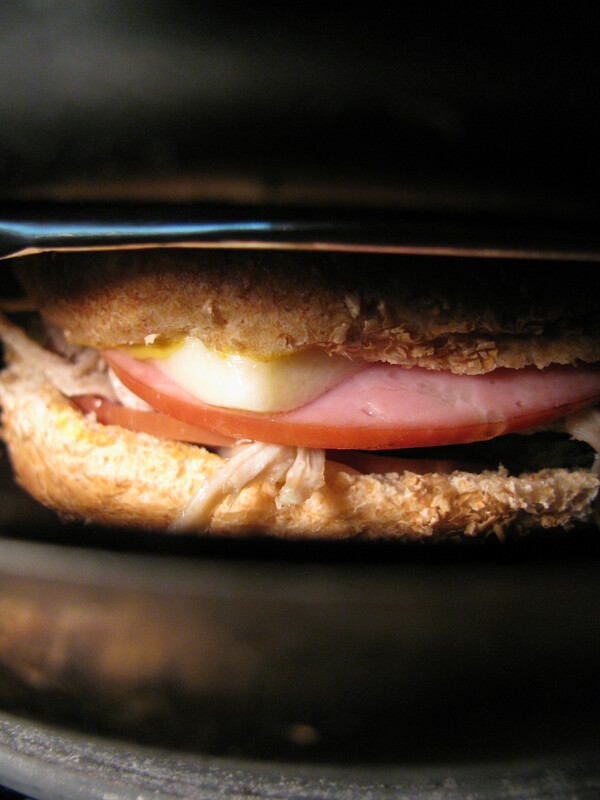 Add the sandwich, then top the sandwich with a piece of foil and something heavy to press it. (I used the pan of homemade applesauce I had cooling on the stove!) Cook for a couple of minutes, or until the bottom of the sandwich is golden brown. Make sure the heat isn’t too high, or the sandwich will burn. Keep an eye on it. Flip the sandwich, and repeat the process with the foil and heavy object. Cook until golden brown. Remove from the heat and serve.